Cannulas are stainless steel tubes with a blunt back (proximal) end and a pointed / machined "business" (distal) end. Blanks are blunt on both ends. 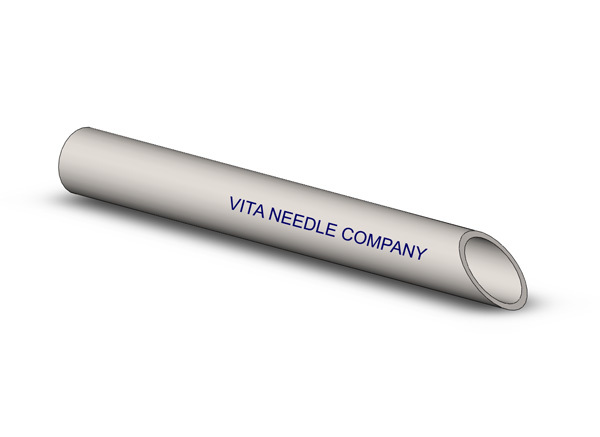 Needles (assemblies) are produced by joining cannula to hubs (fittings). The following diagram illustrates typical end configurations and within process capabilities, a wide range of custom profiles can be produced on stock or custom tube. Highest quality tubing is critical for successful cannulas and needles. T.I.G. welded and plug drawn, full hard temper tubing maximizes the rigidity, tensile strength and finishes of cannulas. 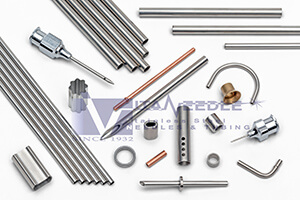 Furthermore, this manufacturing process is essential for best quality parts when cannula undergo second operation cold working such as tube swaging, bending, flaring, diameter grinding or forming. Below is a list of some of our common cannula point styles. Call for more details or to request an alternate cannula style. Some cannulas are subject to size limitations. However, most cannula points can be produced on our stock T.I.G. welded and drawn tubing. Graphical depictions only. Actual appearance may vary with tube/wire size and customer specifications. Marked tubes are not standard, customer must provide specifications if required. A single grind or cut point. Angle must be specified and is measured from longitudinal axis unless otherwise noted. Point is sharpened on back and side of lumen. Primarily for life science and industrial applications with loose tolerances. Gauges smaller than 22 (.028” OD) or thin walls less than .005” cannot be effectively hand sharpened. Also commonly known as lab point style #4 or reverse grind. Primary bevels are machine ground and small volumes are hand sharpened without tolerances. Larger quantities are machine ground and have tolerances applied to primary bevels and rotation angles. Standards: Regular Bevel: 12-15° primary bevel angle, Short Bevel: 18-20°, Quincke Bevel: 25-30°. CNC ground. Sharpened on front of lumen. Consistent geometry and cost effective at volume. Standards: Regular (A) Bevel: 12-15° primary bevel angle, Short (B) Bevel: 18-20°, Quincke (C) Bevel 25-30°. Custom primary angles and angles of rotation available. Primarily used to reduce coring during septum penetration. "Huber" point primary bevel is deflected behind lumen to approximately parallel with longitudinal axis. Please call regarding process limitations. Rotary swaged to a minimal flat then sharpened and polished. Limitations on sizes apply. Certain geometries may require custom tooling to be made and generate a modest engineering charge. Often, customers specify a hole or slot near the tip to permit liquid or gas passage. Formed and hermetically sealed spherical end. Often, customers specify a hole or slot near the tip to permit liquid or gas passage. Hermetically sealed spherical end. Usually selected for cost or when consistent wall is not available due to size limitations. Tapered, non-sharp point. A variation of a swaged (reduced) but not closed end is also possible. 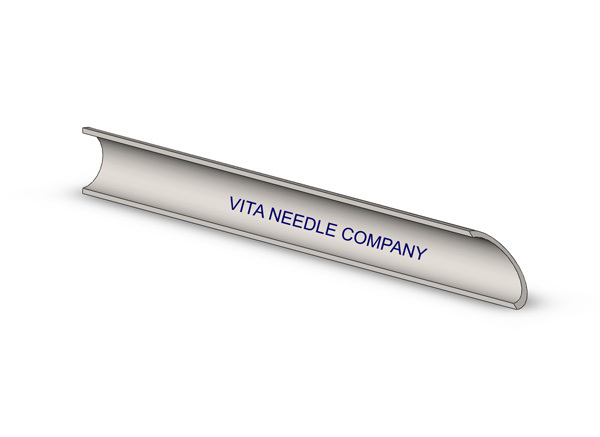 Proprietary technology provides a vastly superior sharp edge, often used for biopsies or precision dispensing. Three faces form a sharp point. For applications with tubing, a two piece welded assembly is typical. Two grinds on opposite sides of a solid wire tip, followed by secondary grinds at the tip. Primarily used for bone biopsies, tube is ground on three sides to create a sharp tip as diagrammed. This variation is also available with two sides (double bevel) or 4 faces. CNC ground with a primary bevel between 20º and 40º, and a secondary bevel formed 360º around the lumen. Primarily used for liver biopsy equipment or similar applications in order to permit sample removal without device rotation. Need cannulas or finished needles quickly? Depending on the style, normal lead times may be anywhere from a few days to several weeks for production of any point (only a relatively small number of sizes and lengths are stock). 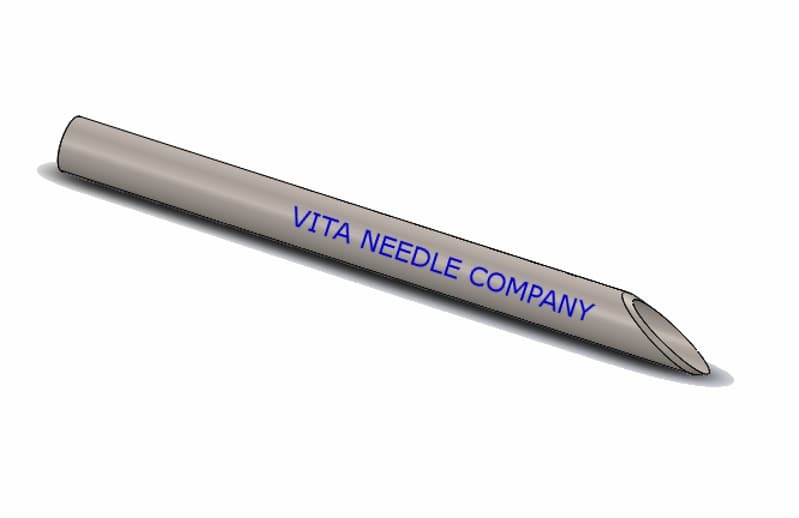 As an option for rapid prototype and small production runs, Vita can produce your desired needle point style in 1-2 weeks or less, depending on tubing size and machine/operator availability. Please let us know if lead time is critical for you and we will quote according to your delivery needs.